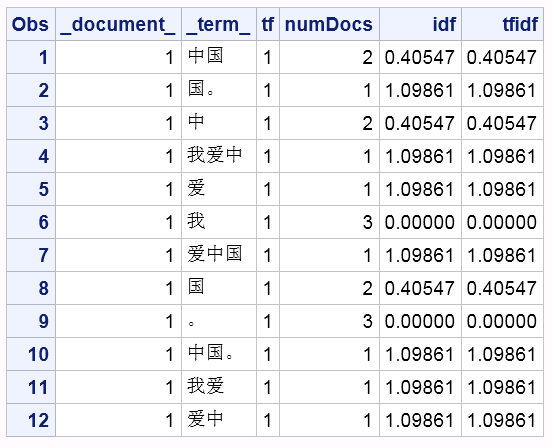 SAS Visual Text Analytics provides dictionary-based and non-domain-specific tokenization functionality for Chinese documents, however sometimes you still want to get N-gram tokens. This can be especially helpful when the documents are domain-specific and most of the tokens are not included into the SAS-provided Chinese dictionary. How many N-gram tokens are in a given sentence? 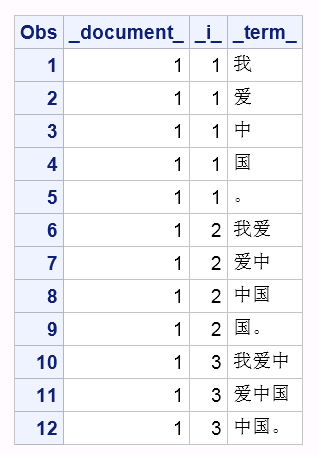 The following table shows the N-gram token count of "我爱中国。" with different n sizes. In real actual language processing (NLP) tasks, we often want to get unigram, bigram and trigram together when we set N as 3. Similarly, when we set N as 4, we want to get unigram, bigram, trigram, and four-gram together. N-gram theory is very simple and under some conditions it has big advantage over dictionary-based tokenization method, especially when the corpus you are working on has many vocabularies out of the dictionary or you don't have a dictionary at all. How to get N-grams with SAS? SAS is a powerful programming language when you manipulate data. Below you'll find a program I wrote, using the DATA step to get N-grams. Let's see the SAS results. Where t denotes the terms; d denotes each document; D denotes the collection of documents. Suppose that you need to handle process lots of documents -- let me show you how to do it using SAS Viya. I used these four steps. Step 1: Start CAS Server and create a CAS library. Here to simply the code, I only tried 3 sentences for demo purpose. Once the data in loaded to CAS, you may run following code to check the column information and record count of your corpus. Now let's see the TFIDF result of the first sentence. These N-gram methods are not designed only for Chinese documents; and documents in any language can be tokenized with this method. However, the tokenization granularity of English documents is different from Chinese documents, which is word-based rather than character-based. To handle English documents, you only need to make small changes to my code. Emily Gao manages two product lines: Decision Manager and Text Analytics. 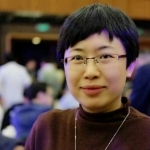 She received her data mining masters degree in 2002, and has been with SAS for 15-years. Thank you for your article over N-GRAM and more over your way of explanation. Currently, i'm working on sentimental analysis of Review data (Amazon data) on SAS EG. I have completed the process of eliminating stoplist word from raw data and doing N-gram process on data, i did TRI-gram on my data but i'm confuse how to do next step for that output data from n-gram process, my aim is to calculate only frequency(term frequency) of neutral, positive and negative word. so could you please help me with any article or any example.